Makeup Remastered- reinvent yourself daily: September Empties - Finally! Quite Amazing. I have my first empties post for you! I seem to struggle to finish product, so I have decided to be more generous when applying, as I am now thinking I am being a bit miserly. It also could be that I love to try a 'few' new things, so juggle a few products at a time. Lush Sympathy For The Skin - A cute tub of hand of body lotion scented lightly with vanilla and hints of banana and cocoa butter which I quite enjoyed. I did find this only mildly hydrating, with the lotion sitting on my skin on drying. I do not think I would repurchase. Kiehl's Deluxe Hand and Body Lotion "Coriander" - A light lotion scented with coriander. Normally I am adverse to anything coriander in the culinary sense. This lotion was a surprise. A delightful "non ol' lady' powdered floral. Light in texture but perfectly hydrating. I will repurchase again. SkinCeuticals Sheer Physical UV Defense. With an impressive SPF 50 rating this sunscreen has been wonderful for my oily, pigment prone skin. It is as the name suggests. sheer on application and does not look shiny. I has some initially whiteness but this disappears almost immediately. Absorbs well when used on its own and works well under my foundation. I even touch up during the day without messing my foundation. I have not had any breakouts from this sunscreen. Works well and works hard. This small bottle lasts for ages. I already have repurchased. Clarins Moisture-Rich Body Lotion - One of my favourite unscented all-round super hydrating body moisturiser. Thicker in texture than the above two- but absorbs well so still good for hot days. I have repurchased a number of times. Nars Pro-Prime Smudge Proof Eyeshadow Base. This needs no introduction. For good reason this eye primer is many people's favourite. Colourless with no residue. Keeps shadows fresher for longer. New one already in daily use. Perricone MD Vitamin C Ester 15 - I love this product which I reviewed here. If tightening and brightening is your goal this could be your saviour. I have repurchased. It is gratifying to have these empties to show you. Only one miss in a post of many good tried and trusted products. Which product do you always have to have back-up of? Ha! I finished these products over monthsssss! 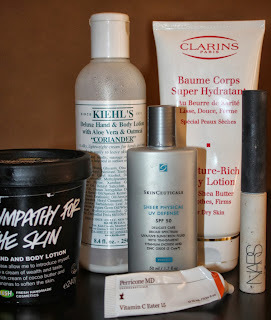 I agree on the backups except for my skincare staples- always something new to try out! I always have a backup of DHC's cleansing oil. It's the one product that has not been superseded, although I do try other cleansing oil samples! Would love to hear about your DHC cleansing oil? !- I am a big fan of cleansing oils/balms even with my oily skin. How did I miss this post?!!! How exciting to see your empties!!! 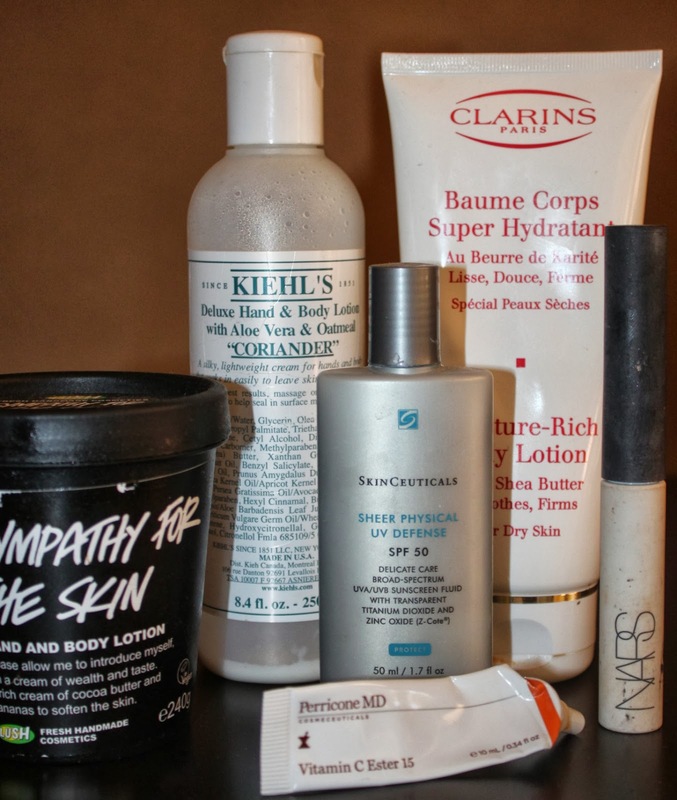 After reading your skincare diaries and seeing this empties post, I guess you REALLY do like the skinceuticals spf:-) And might I say that's super impressive to see and empty of the NARS primer! !